clothes, ride over, sign up, and hit the line 30 seconds before the start. The bike was no where near race condition…I was still carrying my tool bag and the tires were underinflated by 50 pounds of pressure. In the starting photo I'm wearing the lime-green jersey (not enough time to find my Volvo jersey)about the third rider from your left, and a bunch of riders turned around. What are they doing? They're attempting to explain the race-course to me. That’s Art Robledo, to your left of the centerline at the front. After the start a huge paceline formed. I was in the back, didn’t quite like it back there, so I rode up to the front and quite by accident over-shot the leader, who was Art. I got a few miles down the road and made a wrong turn. 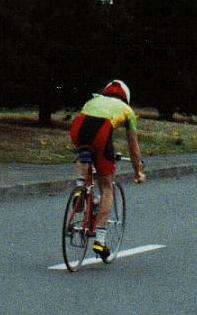 In fact I made four wrong turns during the race, not knowing the course, and there are about three photos of me taking the lead. 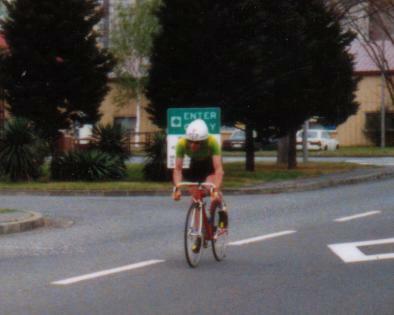 Doug Gilb was a guy I'd met two nights before and invited to the race, not knowing I’d be racing against him. By coincidence, he and another friend were running 2nd and 3rd. We came to the final 2.5 miles and I slowed down considerably to let them catch up. I said,"Okay guys...do either of you know the course?" Neither gave a definite answer so I said,"Okay, here's the deal...we need to agree on a course". We discussed it for a few seconds and decided on a course, and once again I took off. About 1 kilometer from the finish I came across a road guard/race official, I gave a confused look and yelled,"Which way?" He smiled and pointed me on. Three seconds later I heard a yell,"NO!! !I'M SORRY!! !THIS WAY!!!" I slid to a stop, reversed and came back. 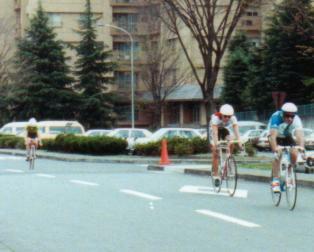 I can still remember crossing the line, looking at the spectators, shaking my head and saying,"In *#!credible!!". 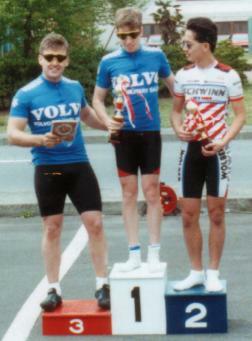 I was so dazed by the mess it never hit me that I'd won my first bicycle race. Doug(who was immediately recruited for our Volvo team) got second, and Pat got third. These two wins were a relief--from the start I was expected to start winning, for some reason. But they were disappointing. When I crossed the finish line I just felt like,"So what?" The wins were too easy, each one just a case of me picking my time and taking easy wins against minor competition. I wanted a challenge.